The Complete Cities of Ancient Egypt, by Dr. Steven Snape, instructor of Egyptian Archaeology at the University of Liverpool, reveals the astonishing urban world of ancient Egyptian civilizations, from large cities like Memphis, Thebes, and Alexandria, to lost centers like the enigmatic Amarna of the pharaoh Akhenaten. The Complete Cities of Ancient Egypt additionally summarizes the latest urban discoveries in the field of Egyptology. The Complete Cities of Ancient Egypt is a visually stunning book with 242 illustrations (of which 193 are in color.) The illustrations are of outstanding quality. 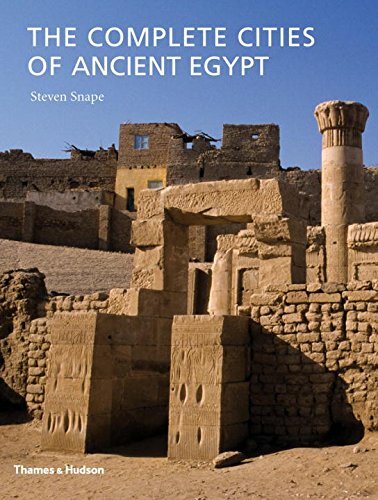 Diagrams, visual reconstructions, ancient works of art, and impressive aerial photography contextualize Snape’s analysis of urban life and culture in ancient Egypt. Aside from the illustrations and photographs, we also appreciate the maps found throughout the text, although we wish that timelines in chronological order had been included for each of the cities covered. Throughout The Complete Cities of Ancient Egypt, primary source documents are seamlessly incorporated into the chapters, which should arouse the interest of the general reader and expert alike. Other features in the publication include an introductory chapter, a useful glossary with terms in English, a “Recommended Reading” section with excellent suggestions for further study, an acknowledgements section, the sources of illustrations, and a general index. One is surprised not to find a chronological list of emperors or a list of key battles with corresponding dates in the text. Ancient History Encyclopedia recommends The Complete Cities of Ancient Egypt to Egyptologists, urban historians, archaeologists, and engineers interested in ancient history, social or cultural historians, and anyone interested in ancient Egyptian society. This volume has been published in English through Thames & Hudson in the United States and is currently available for $50.00 in hardcover. Snape, Steven. "The Complete Cities of Ancient Egypt." Ancient History Encyclopedia. Last modified September 18, 2014. https://www.ancient.eu/review/66/. Snape, Steven. "The Complete Cities of Ancient Egypt." Ancient History Encyclopedia. Ancient History Encyclopedia, 18 Sep 2014. Web. 20 Apr 2019.